When Donald Trump promised to drain the swamp, many of his supporters hoped he would take on the political and media establishment and radically shake them both up. In that process they might have assumed he was going to clean up politics by removing the Beltway insiders and the corporate lobbyists who have often pulled strings in Washington. Whilst the former has happened, the later has not. It is increasingly becoming clear that the swamp is being re-filled by an oligarchy, where the ultra-rich who fund Trump control what is going on. The President is a puppet on a string. 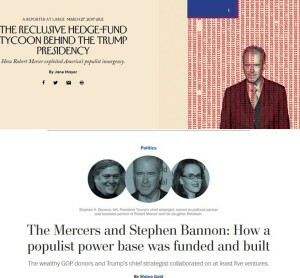 Mercer, who is famous for being shy and reclusive, lives on Long Island, and made his millions as co-CEO of Renaissance Technologies, seen as one of the most profitable hedge funds in the US. But for years now, Mercer has been shaping the political and public arena in the US by pouring tens of millions into causes that resonate with his libertarian views, which include climate denial. He is one of the main stakeholders and funders of Breitbart news, the standard bearer of Alt-Right conspiratorial news on the internet of which Trump’s chief of staff, Steve Bannon was executive chairman, before joining Trump’s team. Mercer has poured over ten million dollars into the venture. Bannon and Mercer are close. For the last five years, Bannon has acted at Mercer’s de facto advisor. But Breitbart is just the tip of the iceberg of Mercer’s hidden influence. Between 2008 and 2016, the Mercer family foundation pumped at least $77 million in political donations and gifts into what the Washington Post calls “a vast universe of causes across the conservative landscape”. Not everyone is happy about Mercer’s growing influence, including some of his colleagues. Earlier this year a colleague at Renaissance, David Magerman, published an op-ed in the Philadelphia Inquirer. Rebekah Mercer, one Robert’s daughters and an ex-Wall Street trader, has become central to Breitbart and then later to Trump, with her sitting on Trump’s transition team. “She is the First Lady of the alt-right,” Christopher Ruddy, the owner of the conservative outlet Newsmax Media, told Jane Mayer at the New Yorker. “She’s respected in conservative circles, and clearly Trump has embraced her in a big way.” Rebekah Mercer is now leading a group called Making America Great to support Trump’s agenda. There are even those that believe that the Mercer funding of Trump may have broken the law. The New Yorker quotes Brendan Fischer, a lawyer at the Campaign Legal Center, who “said that the Mercers’ financial entanglement with the Trump campaign was ‘bizarre’ and potentially ‘illegal.’ The Center has filed a complaint at the Federal Election Commission. The magazine recalls how one of the issues that Nick Patterson clashed with Mercer is over climate change. Despite this the petition is still widely circulated on Facebook. After Trump won the election, Rebeka nominated the climate denier, Arthur Robinson, be named as national science adviser, although this recommendation was not been taken up. The Mercers’ link is to climate deniers goes deeper too. According to a 2013 study by Drexel University sociologist Robert Brulle, entitled “Institutionalizing delay: foundation funding and the creation of U.S. climate change counter-movement organizations,” The Mercer Foundation spent nearly $4 million directly funding groups funding climate denial between 2003 and 2010. Others have the figure much higher. Earlier this year, Desmog estimated that the Mercers had pumped at least $22 million into climate denial organizations. The Mercer Foundation, which is run by Rebekah, has also donated $5 million to the leading sceptic think tank, the Heartland Institute. In three days time, Heartland will hold its twelfth climate denier conference. Many of the usual climate skeptic suspects will be there. Aside from Heartland, the sponsors are the Media Research Centre, which received $13.8 million from the Mercer Foundation from 2008-2014, and the Heritage Foundation funded which has received $1 million over the same period. As the Washington Post notes: “What sets the Mercers apart is their interest in finding new ways to shape the environment in which policy issues are debated”, and that is exactly what the Mercers are doing on climate and the wider pro-Trump campaign. Robert Mercer, the man who swung the election for Trump.